Cookies that you have to roll and cut out have always seemed like too much work for me, but I really was interested in this recipe. 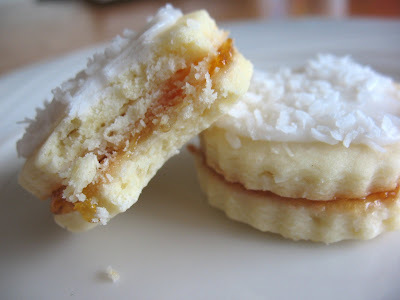 Buttery shortbread like cookies, sandwiched with jam, and topped with a coconut glaze? Yum. The original recipe called for seedless raspberry jam, but somehow that didn't jive with my taste buds. Why use raspberry when I have mango apricot jam in the cupboard? Mango and coconut just seems to go together better. So I made the dough with all these fantastic intentions, and then drama hit and there the dough sat in my fridge for a few days. Yesterday I finally got around to actually making them. Oh, wow. They are so good! The cookies are initially crisp and delicious all on their own, but they soften up a bit when they sit overnight and soak up some of the moisture from the jam. The result is amazing! 1/2 cup good quality jam. I used mango apricot, but I think vanilla apricot would be delicious too. In a large bowl with an electric mixer, beat the butter with sugar until light and fluffy. Add the egg and vanilla, continuing to beat. Whisk the flour, coconut, baking powder and salt together in a seperate bowl. Stir into the butter/sugar mixture in two additions. It's going to look a bit dry at this point, but don't worry. It comes together. I stirred it together best I could and then dumped it out on the counter and used my hands to bring it together with a slight bit of kneading. You don't really knead it, but work it just a teeny bit and it comes together. Be careful, though. The trick is not to over handle it too much. Divide the dough in half, and shape each half into a disk. Wrap in plastic wrap and put in the fridge. You can let it chill for about 30 minutes, or if you are like me you can leave it for a day or so. Roll the dough out onto a wax paper lined counter. A way to keep your waxed paper from flying around is to spray the counter with a bit of water before you lay down the paper, and then it sticks to the counter. The original recipe said to roll the dough to 1/8 of an inch thick, but I really am lame at estimating that sort of thing. Mine are obviously thicker. It doesn't make too much of a difference, other then you will have more cookies if you get them thinner. Cut out your cookies with a fluted 1 3/4 inch cookie cutter and transfer them to a cookie sheet, placing them about 1 inch apart. Keep rolling and cutting, re-rolling scraps, etc until you've used all the dough. When the cookie sheet is full place it in the freezer for 10 minutes. I know! Sounds so weird. Works, though. Do it. Bake those babies in the middle of a 350 F oven for about 8-10 minutes until light golden. Remove them from the cookie sheet and let them completely cool before you glaze 1/2 of them. You should, in theory, get about 96 cookies. I didn't. I ended up with about 1/2 that, which attests to my rolling and cutting skills, lolol. Just stir all the glaze ingredients, except the coconut, together in a bowl. You have to use your judgment for the milk part. To make it spreadable, I kept adding bits of milk here and there and stirring until it was still sort of thick but I'd be able to spread it. Okay! So ice the tops of 1/2 of the cooled cookies. Dip them in coconut as you go so they look pretty. Let dry for about 30 minutes. Spread about 3/4 tsp jam over the bottom of an un-iced cookie, and sandwich with an iced one. Let stand about 30 minutes until they are set. Makes 48 cookies if you are the boss at rolling, or more like 30-ish if you're like me and like them a bit thicker.